The only Organist recording exclusively for H.M.V. 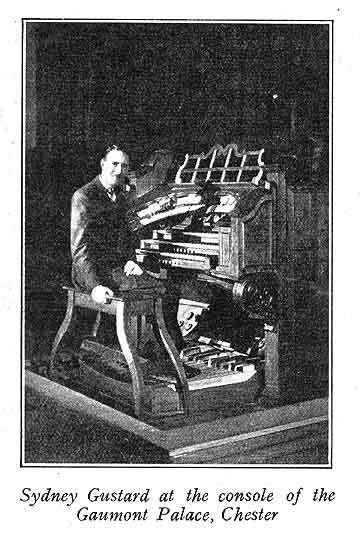 The cinema organ undoubtedly owes a good deal of its present popularity to the vast number of gramophone recordings which are sold all over the world, and I welcome the opportunity of relating some of my experiences at recording sessions. The "man in the street" has a very hazy idea of how records are made, and lots of people must wonder how an organ, which of course cannot be taken to the studio, is recorded at all. In this case, Mahomet comes to the mountain, in the shape of a recording van. I well remember the day, about four years ago, when the H.M.V. recording van rolled up to" the Trocadero, Liverpool, to make my first tests on the small 6-unit Wurlitzer there. Recording has made vast strides since then, but those early efforts still sound very fresh and sweet, and the "Cuckoo Waltz" I believe is still one of the best sellers. 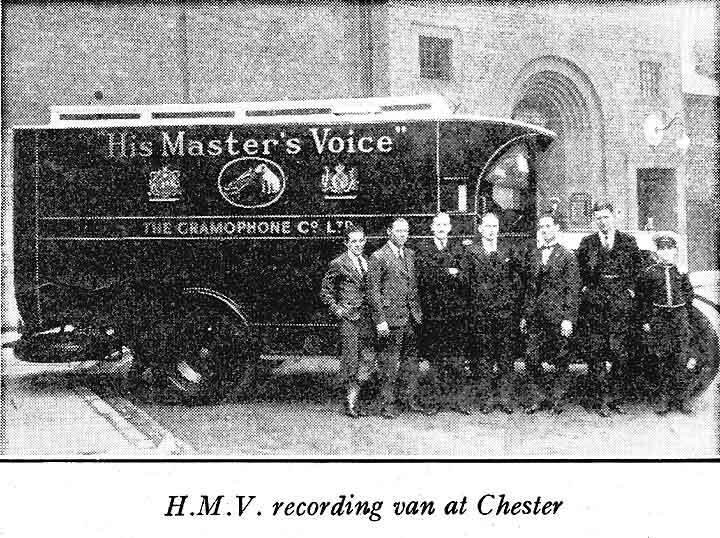 The recording van, which you see in the accompanying photograph, is a completely self-contained recording studio, and is valued at about £10,000. It weighs 7 tons, contains two recording machines, loudspeaker, and a vast amount of very delicate apparatus. It is connected by land-line to the microphone, which is slung in front of the organ shutters, a loudspeaker stands near the console, also a signal light which is illuminated while recording is in progress, and the recorders are in telephonic communication with the organ console. There is a good deal of preliminary work to be done before the van arrives, as each title has to be carefully timed and suitably arranged for recording. As soon as everything is ready, we proceed to make a test record, which is played back through the loudspeaker. This gives both recorders and performer some idea of what the finished article will be like. Probably a particular stop or combination of stops appears dangerous to the recorders, and after making the necessary adjustments, we go all out on a master record. The wax on which the original sound trace is cut is 1 inch thick, and rotates horizontally on a heavy turntable, a " stylus " cutting the trace of the sound waves, as it is fed towards the centre of the disc. The " play-back " of the test record, to which I previously referred, is performed by means of a special electrical pick-up, the wax being too soft to take an ordinary pick-up needle. This wax of course is then Useless, but as soon as a " master " has been made, it is at once numbered and carefully packed off to Hayes, where it goes through the various stages of development until he finished record appears. A recording session can be very nerve-racking on occasion - sometimes everything goes smoothly (on one occasion we made ten records in two mornings), but sometimes everything goes wrong, and one has to play the same title over and over for hours on end, until one never wants to hear the wretched tune again. I am fortunate at Chester in being able to record in the mornings, but I remember two sessions at the New Victoria, London, when we were at it from 11.30 p.m. until 5.30 a.m. The small hours of the morning are not exactly ideal for a soulful rendering of "Love's Old Sweet Song," and I must have almost fallen asleep on the second "master," as the recorders rang through to enquire (verv politely) " why the ---- I had gone an inch over the edge." The Chester organ is ideal for recording purposes, the two chambers being situated over the proscenium arch, and judging by the letters I have received from organ enthusiasts since broadcasting began, it apparently comes "over the air" just as effectively. One of our most interesting experiments here was when we persuaded patrons to remain after the show and try their voices in community singing with organ accompaniment. A test record was made and played back to the audience, and how they sang on the subsequent "master"! The chief difficulty was to restrain them from singing in the non-vocal items. Every organist has some amusing experience which sticks in his memory , and I can distinctly remember an occasion here at Chester when I played a little trick on the audience with one of my records. The record was synchronised through the talkie loudspeakers with my playing, and at an agreed signal, a complete "black-out" enabled me to disappear behind the console. When the spotlight was flashed on the empty console, with the record playing, we managed to have the audience suitably mystified, but what I didn't bargain for was to overhear the remark (from the "ninepennies"), on my return to the console, "Didn't I tell you he never really plays that ---- organ!" Which goes to show how very careful we organists have to be in these mechanical days.